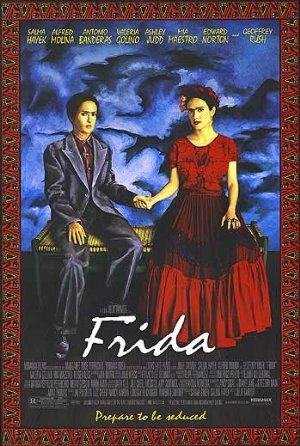 An Academy Award-winning biography of Mexican artist and revolutionary Frida Kahlo, who channeled the pain of a crippling injury and her tempestuous marriage to mentor and fellow artist Diego Rivera into her self-portraits. Based on books written by Hayden Herrera. Throughout the film, a scene starts as a painting, then slowly dissolves into a live-action scene with actors. I saw this when it came out, a good film but my gut memory was that it kinda missed the point of what makes someone an iconic legend. It was sortof too nice about her intensities and weaknesses. Perhaps I should see it again after reading a good biography and looking at her paintings more.